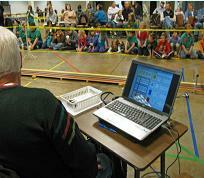 Digital Timer, Sophisticated Software and custom built Tower for any Pinewood Derby or Awana Grand Prix event. 1 to 4 Tracks supported using the computers USB port with no external power source required. The supplied Micro Controller chip reads all Times within 1/1000th of a second. All Window platforms are compatible. The program offers three Racing Formats: Round Robin, Double Elimination and Progressive. Several Reports are generated showing Best Time, Average Time, Accumulated Times, Global Positions and many more. A Flowchart is generated for every Scenario showing in Real-Time Who's on Deck, Name and Car Number, Heat Number, etc. which can be printed. The program has three running Modes: Tutorial, Race and Practice. The program offers an 'UnDo' option for re-running any Heat. 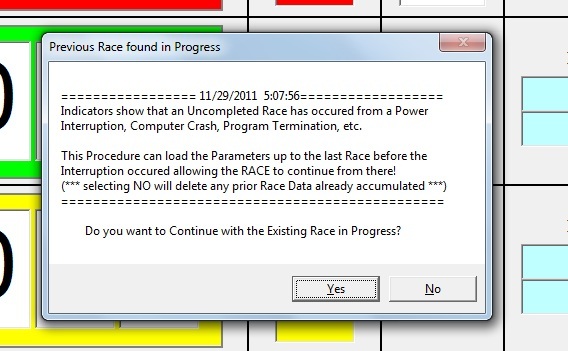 The program also offers a unique option to Re-Load a current Race in progress in case of a Catastrophic Event such as a power failure, computer failure, etc. No Data is lost. To sample the software, a limited version can be downloaded for free from the 'Purchase' tab. You can download the trial software and try in 'Tutorial Mode' before you buy! 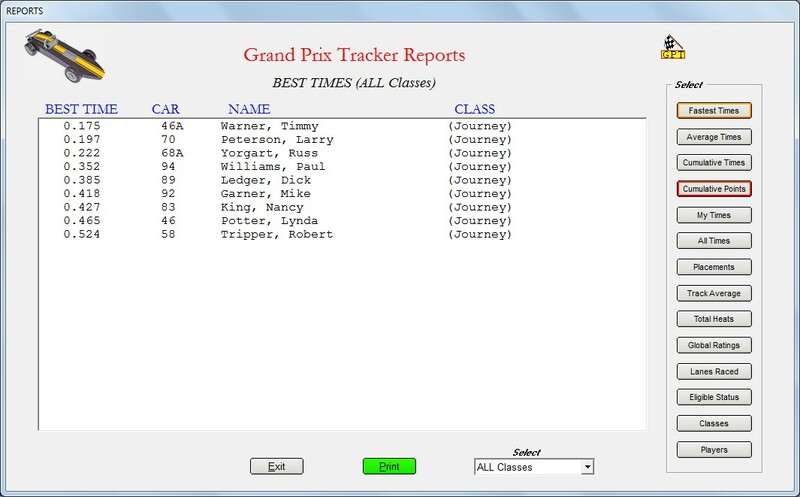 Create the simple Roster, set-up your racing Schedule and let my sophisticated Software run your Race. This Hardware, Race Tower and Software was designed by me (an enthusiastic father and spectator for the past 30 years) as a unique Race Management Package to 'Measure and Record' elapsed Race Times and calculate Finished Racing Positions for any miniature model race track. It also performs Record Keeping associated with all aspects of the race for each player. The 'Grand Prix Tracker' is designed for the Awana Grand Prix, the Pinewood Derby, the Shape 'N Race Derby, the Kub Kar Derby, the Cub Scouts, the Royal Rangers, the Lego Derby or any other similar racing event where miniature racing Timed Events and Placed Finished Positions are essential. The tracks Tower is customized to fit your tracks 'width & lane' dimensions from 2 to 4 lanes with a general height clearance of 8.5 inches. Built using Aluminum material not plastic. A great advantage of this system is that the solid state Interface Board connects to any USB port on your computer, thus eliminating the ever disappearing serial and parallel ports (no additional USB adaptor needed). This software runs in the Windows Platform (not DOS) and has been tested using Windows XP, Windows Vista, Windows 7, 8 & 10. Complete accurate 'elapsed race times' are acquired via the digital microcontroller chip (independent of the Windows environment) which does the actual timing process to within one thousandth of a second. The software will track a roster of up to 96 active players and will accumulate and compute all Race Data throughout the Event (accommodations can be made for larger Rosters). The Database itself can hold 200 players. The Race Times are displayed on the computers monitor in real time (displaying it on a large TV screen or Projector is an added attraction) in colors matching your track. 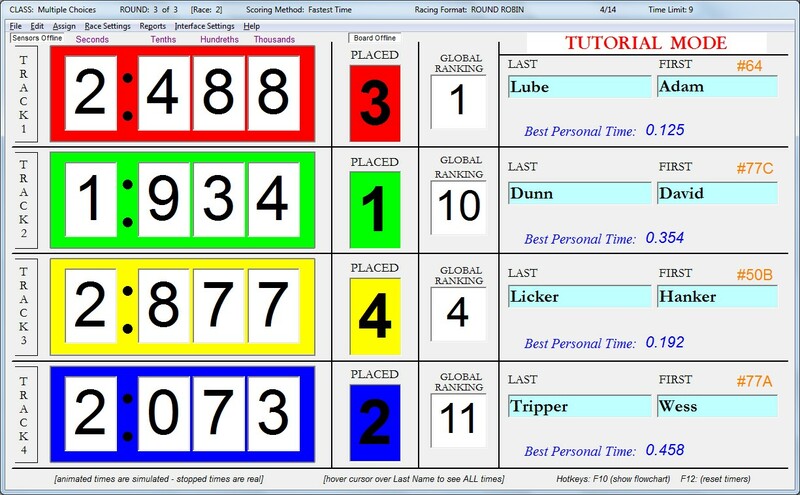 The software offers three exciting Racing Formats: Double-Elimination, Round Robin and Progressive. Each are different and exciting in their own way. The formats are fair to all players and gives each participant several heats to race before being eliminated. All formats use rotating lanes thus eliminating any lane handicaps, while generating Random player selections when possible. 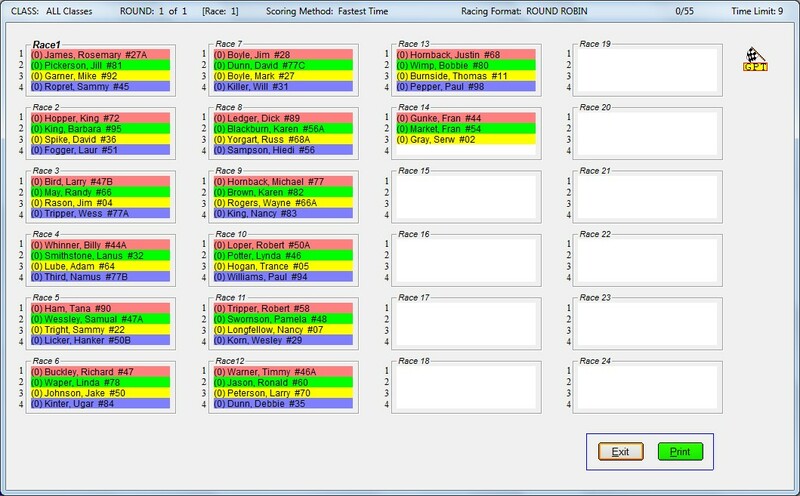 A real-time Flowchart can be viewed (or printed) at anytime displaying the current status of the race as it unfolds showing Races Ran, Racing Order, Lane Selection and Who's-on-Deck. Many different Reports are generated showing Best Times, Average Times, Accumulated Times, Accumulated Points, Individual Times, Global Times, Track Average and much more in real-time that can be viewed or printed at anytime. 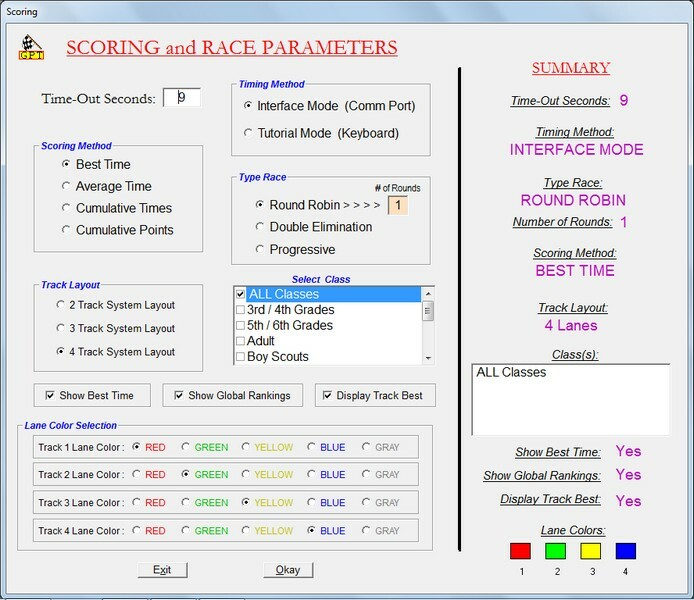 The software allows for many custom schedule settings depending on the type of Race Format chosen including changing the Timers (time-out length) in seconds. The software offers an 'Undo Heat' option where any Heat can be re-run if the results were undesirable. The software allows for various running modes: Race Mode, Tutorial Mode and Practice Run Mode. Great care was taken in the software that allows for complete Race recovery in a catastrophic event caused by a power or computer failure so that NO previous race data is lost! This Grand Prix Tracker can be purchased as a Complete Package or Build Yourself Version using my Software, Schematics, Parts List and Construction help. Much more detail is contained in the programs 'help' files.